The sun is setting, they wrap their arms around you, kiss you softly on the cheek and you raise a glass of champagne to your future. There’s nothing quite so sweet as romance abroad, and this is one of the potential relationships you can find on MyTravelDate.com. The website is set up with dating in mind, although it’s also available to help people find travel buddies. Question is, how effective is it going to be in helping you to find someone to travel with, romance or not. When we performed a basic search there were a decent number of results, and many members had uploaded attractive photos. In fact, the members' photos were so attractive, with members showing off their best physical traits in swimwear, that we were a little suspicious. If you’re looking for someone beautiful to travel the world with, this seems like it could be the place to come. 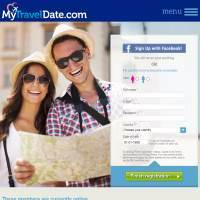 Some people will have a problem with the site’s premise of travel dating, though, which is that it seems quite risky. Deciding to travel the world with someone who is interested in you as a “date” isn’t exactly the safest thing to do so, if you are interested in pursuing that kind of relationship, then do so with caution. Okay, enough cautioning. So what does the site have to offer? You can create your own profile page including photos. Whilst many have uploaded a picture or two, a number of people haven’t and even more members haven’t bothered to include much information on their profile. This doesn’t bode well. You can’t see who is online or when they were last online either, so you may end up sending out umpteen messages without getting any replies. At least there are a couple of communication options, namely: email-style messages (allowing you to send and receive correspondence in your own time) and live chat (which allows you to read and respond instantly). There are no forums or other community features to mention though, which is very disappointing given that this seems the perfect place to get talking to people from around the world. Frankly MyTravelDate seems a little bit suspect. Even if its glamorous members are genuine, they haven’t made much of an effort to finish their profiles, and there are far too few features to make this site stand out. Aside from this, it isn’t particularly cheap to join. If you’re really insistent on finding a romantic partner to travel with, then perhaps it’s worth a shot but otherwise we’d recommend looking elsewhere.